Determining whether you should move on from your job isn’t always an easy decision, but sometimes it’s a necessary choice to make. According to Forbes, more than half of Americans are unhappy at work, and according to a Gallup poll, nearly 70% of U.S. workers are not engaged in their jobs. Sometimes feeling content with your job is just not enough, and having negative feelings toward your workplace can often lead to added stress and anxiety, which can deteriorate your health. In the past, choosing one career to stick with for the next 40 years until you retired was the status quo, but not anymore. A recent CNN article indicated that most people will switch employers at least 4 times by the time they are 32. I don’t think they were referring to the range of part-time jobs college students have, either. These days, it’s perfectly normal to want to move away from your current job in hopes of finding a better option, switch career paths, or strike out on your own and start a business. 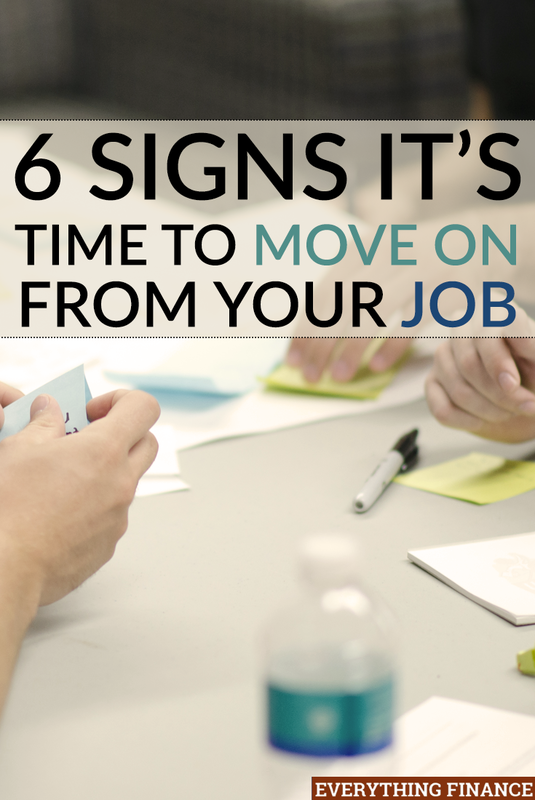 Here are 6 key signs that indicate it may be time to move on from your current job. If your job is no longer challenging you in a healthy way, and you can’t utilize the skills you have, it may start to become boring. A boring job seems like a complete waste because you probably aren’t learning or growing, which can lead to a lack of fulfillment. I once had a super boring job that I held onto for three years. Months before I quit, I started to dread going into work because I knew it would be boring and I wasn’t learning anything new. There were no opportunities to attend conferences or training, and I felt like my time and potential were both being wasted. If you have other skills you’d like to utilize and things you’d like to learn that your current job doesn’t provide, you might be better off in another position that might even offer a better salary. Have your interests changed since you landed your job? Do you have other passions and ideas for your career? Being stuck in a job you are no longer passionate about can be stifling to your creativity and your happiness. The best thing you can do if you feel you are lacking passion for your work is to see if you can change your job title within the company, or take on other roles and responsibilities to see if you would like to do something else instead. Additionally, you can always start working on a side hustle outside of your main job so you can determine if there are other ways to earn money that make you feel more fulfilled. If you don’t receive any feedback from your manager or supervisor, it will be tough to grow and improve professionally. Also, working without any direction is tough, and you’ll never know if you are doing your job correctly, which could come back to bite you later down the line. If your superiors don’t take the time to invest in your professional growth by offering you advice, feedback, or a regular performance review, this may be a red flag that you probably won’t be able to move forward professionally with that employer, and you may want to start looking elsewhere for employment. Speaking of growing professionally, you should always be able to look for growth opportunities whether it’s a promotion, pay raise, etc. I’ve had some jobs where I knew my stay would only be temporary because I saw no future for myself there. If you haven’t received a decent raise for a while, and there are no higher position to consider in the future, there will come a time when you’ll have to determine what your future will be and whether or not you should move on. Work-life balance is a must if you crave longevity in your career. It’s important to be able to separate work from your personal life and avoid getting burnt out. If your employer frowns upon people who take paid time off, implies that you should work outside of your regular hours, or always pushes overtime and fails to implement a welcoming company culture, you may have a very lackluster work-life balance. Even if the money you’re earning is good, you should consider your happiness and mental health, too. It’s important to have enough time to have a life outside of work and take care of other responsibilities. Sooner or later, even the most enthusiastic workaholics get tired. Even if your job is going perfectly fine, you may not be able to resist a good offer when it comes along. Maybe a recruiter reaches out to you with another opportunity that provides you with the job description and pay raise you always wanted, or your side hustle takes off and starts to compete with the income from your day job. A better opportunity is always a sign that you might want to move on from your current job in order to advance your career and embark on a new journey. If you’re experiencing one or more of these key signs, you may have quite a bit to think about when it comes to your professional future. Leaving a job can be scary, especially from a financial perspective. It’s important to make sure all your ducks are in a row financially before you leave your job to pursue another opportunity. Even if you secured a higher-paying position, there is no guarantee you will love it and stick around, so it’s best to prepare your finances ahead of time. Make sure you have a large emergency fund and save regularly. Also, make sure there is no lapse in your benefits (especially insurance) if you are switching employers. Don’t forget to adjust your budget to your income and cut out expenses you don’t need to ease your financial burden. Have you ever left a job after realizing any of these key signs? How did you move forward?